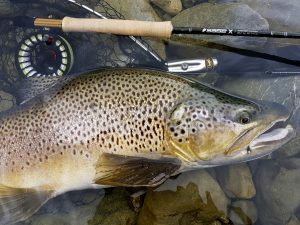 Nelson / Marlborough and the upper West Coast regions of New Zealand’s South Island have become favourite destinations for any fly-angler serious about their sport. 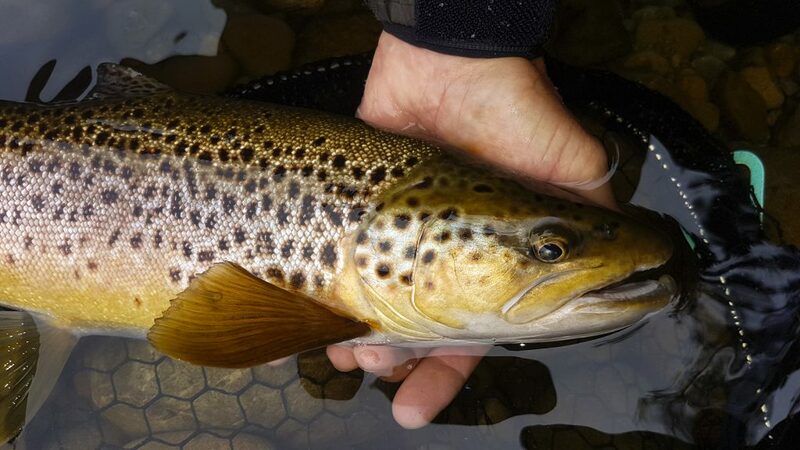 If you love clear waters and wild places come and explore the amazing rivers at the top of the South Island and catch some of the best quality brown trout in the world. 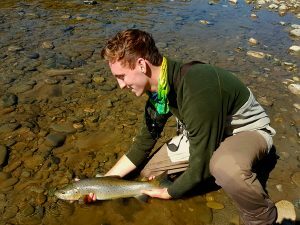 The Open Season for trout fishing in the top of the South Island is from October 1st to April 30th on all rivers. November to March is the most popular period for overseas visitors to fish here. There is however excellent fly fishing at any time during the season. Typically the highest average daily catch rates are achieved prior to Christmas, before trout are fished over by many other anglers. 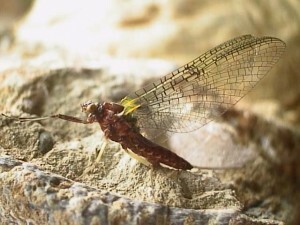 Peak months for dry fly fishing mayfly hatches, are mid-November to mid-December and mid-February to the end of April. Good nymph fishing is available throughout the entire season. Dry fly fishing using cicadas, peaks from mid-January to early-March. Willow-grub dry fly fishing peaks Jan-Feb and Passion-vine hoppers are from mid February to late-April. The best opportunities for trophy trout (in excess of 4.5 kg / 10 lbs) are usually from late-November to April. Trophy trout numbers vary considerably from season to season. …. I encourage anglers interested in pursuing trophy trout to discuss the prospects directly with me. I’ll give you an honest appraisal based on recent observations in the field. You need to give me an honest appraisal of your skill levels, experience with large trout and your ability to get around on rough rivers. Big trout don’t come easy! 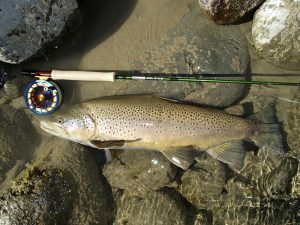 There are limited areas open for fishing from May 1st to September 3oth (Winter Season), which provide opportunities to fly-fish beyond the peak season. 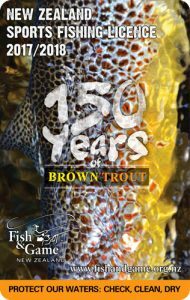 NELSON-MARLBOROUGH FISH AND GAME … ANNUAL FISHERIES REPORT 2017-18 … Follow this link for a summary of the 2017-18 fishing season, produced for licence holders of Nelson Marlborough Fish & Game region. Every person who intends to go fresh water sport fishing in New Zealand must first purchase a licence. Fishing Licences are issued by Fish and Game New Zealand who are the statutory managers of freshwater sports fishing and game bird hunting in New Zealand. Licence fees were originally spent mostly on increasing fish and bird populations. Priorities changed in the 1960’s when management became more focused on protecting important habitat. Habitat advocacy remains the major focus of Fish and Game Councils and a significant percentage of the councils’ money goes into advocating habitat protection. All non-resident visitors to New Zealand must purchase a Non Resident Licence so please check out this link for more details. A Whole Season Non-Resident Licence is required if a visiting angler wants to apply for a Back Country Licence or a Controlled Fishery Licence. – Nelson-Marlborough: Travers River, Goulter River, Upper Wairau River, Upper Matakitaki River. – West Coast: Karamea River, Mohikinui River. Fly fishing techniques vary according to the time of year, the size of the stream fished and flow conditions. The most successful methods we use are nymph and dry fly. Flies range from size #18 – #8 depending upon circumstances. Rod / Line combinations are best in the AFTMA #5 – #7 range, in rod lengths 8′ – 9’6”. Lighter line weights from #3 – #4 are fun during the lower water flows from mid- January to mid-March. Floating lines are typically used for 99% of the fishing, although sink-tip and full sinking lines are useful at times. The choice of Weight Forward or Double Taper is a matter of personal preference. Line colour is important. For daytime fishing I recommend using green, olive, earth-tone or grey coloured lines. Bright coloured lines have a place for evening fishing, but are definitely counter-productive the rest of the time. I know this from experience, so please leave the flouro-orange line at home! Over all leader length including tippet will range from 12′ – 17′. Bring nylon leaders that are 9′ – 12′ long, tapering to a minimum of 2-3X. We can refine the taper from this base. Tippet sizes range from 3X – 5X depending upon river flow, water clarity and trout size. I have a range of quality Sage rods and Rio lines for my customers to use, but only have a limited range of boots and waders. Anglers are generally expected to provide their own equipment. I supply flies at no extra charge, but if you have favourites of your own you wish to try, bring them along. Between us the trout will be in real trouble! Fishing clothes and hats should be subdued colours. Beware blues and yellows as you will become a focus of interest for bumble bees and wasps (yellow jackets). Good quality breathable waders and rubber soled wading boots are recommended. N.B. Felt soled wading boots are banned in New Zealand and will not be allowed through Customs. We often ‘wade wet’ throughout the warmer summer months from late December to mid March. Polypropylene long underwear under cotton wading trousers or shorts are great for wading wet. Ensure that you have a top quality, water and windproof rain jacket. To effectively spot trout, polarised fishing glasses are essential. A wide brimmed hat is useful for protection against our sun. It will also aid with reducing glare to assist in spotting trout. A quality sunblock (SPF50+) is important in New Zealand. New Zealand is a sub-tropical island chain in the South Pacific Ocean, lying across a westerly airflow in the Roaring Forties. Nelson Province lies at latitude 41′- 42’S. New Zealand has a variable temperate climate. The climate in the northern area of the South Island is mostly pleasant, boasting New Zealand’s highest sunshine hours. However the weather can change at any time and wise anglers come prepared for extremes. 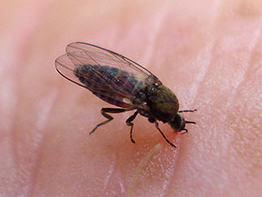 You may have heard of New Zealand’s infamous ‘sandflies’, which are similar to ‘blackflies’. They can be a nuisance, especially on evening or just prior to rain. Regular use of a good insect repellent helps control them to tolerable levels. This is readily available in local stores; gels, liquids or roll-ons are better than sprays. Use repellent liberally and sandflies are seldom more than nuisance value. For anglers who react when bitten, hydrocortisone cream 0.5% – 1% are excellent for taking away the inevitable itch. It is a useful addition to the travelling first aid kit. Unlike ‘No See-ums’ … at least these little guys are big enough for you to get your own back! From late January to late April, wasps (yellow-jackets) are around in many areas of our native beech forests. Wasp stings are very unpleasant. Anyone who is allergic to either bee or wasp stings should ensure they carry their medication with them at all times. Be sure to advise their guide. Mosquitoes are rare and seldom a nuisance. They carry no disease and are only around at night in some remote wilderness areas. … but plenty of trout.